Freezing soup is simple and lets you make ahead a meal for busy nights. What is better than a bowl of steaming hot homemade soup on a cold winter day? To round out the meal grab some dinner rolls, bread sticks or cornbread from the freezer and warm them in the oven or microwave. Dinner is ready in 10 minutes and you hardly have to lift a ladle. People often ask ‘can you freeze soup?’ And there are mixed answers out there. You can freeze any soup, some soups however change or need modifications to be successful in the freezer. Keep in mind freezing soups can cause some ingredients to change when your looking at recipes or cooking up a big batch of soup to freeze and you’ll be able to modify your favorite soups for the freezer. Since getting my freezer I always make enough soup to freeze one or more meals for later and have dinner that night. Ingredents can be easily adapted for the freezer. Vegetables soften when frozen and reheated so I recommend undercooking them slightly for best results. Pasta softens in the freezer and again when reheated. I recommend adding fresh cooked pasta when it’s time to serve the soup. Pasta cooks fast and without much attention from the cook so it’s still an easy meal and you save space in the freezer. Potatoes that are chopped or diced change texture and become more grainy. Some people don’t mind and others hate the change. Potatoes that are pureed, however, do not have much texture change. Follow your own tastes on spuds. Rice can soften but doesn’t become nearly as soft as pasta. Also, less processed rices like wild rice and brown rice don’t seem to soften as much as white rice, converted rice or instant rice. In my opinion it is best to just slightly undercook the rice by about 10 minutes or so if your worried about it being too soft. Because rice can take 20 minutes to a hour to cook, unlike pasta that cooks in 8-15 minutes I like to have the rice already cooked, frozen and in my soup. 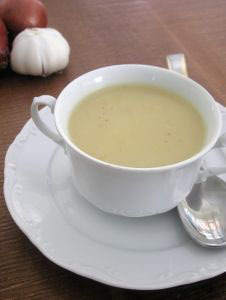 Milk and cream are often avoided when freezing soups. Many people think they separate or curdle. I have never had problems with curdling and if the milk or cream separates it’s easy to mix it back together. Freeze it ahead in your soup or add when reheating, the option is yours. Eggs can become rubbery. So don’t freeze Egg Drop Soup. Freeze the broth base and add the eggs before serving. Freezing soups that are still hot means the soup takes longer to freeze, has larger ice crystals that can effect the texture, especially of veggies and pastas or rice and results in lower quality. Plus there is an even bigger risk. 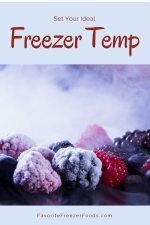 Hot things in the freezer can raise the temperature in the freezer or cause foods near them to start to thaw. Not a good idea. Leaving the soup in the fridge overnight if you have to before freezing is better than putting hot soup in the freezer. What good is freezing your extra soup if half of it still goes to waste. 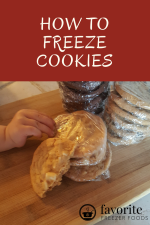 Freeze in sizes that your family can use and when in doubt use a smaller size. It’s better to grab an extra package of frozen soup than to throw out leftovers no one wants. 1 cup is a snack size for one person, 2 cups a meal. 2 cups plus half a sandwich each is a nice light lunch or dinner for two people. I don’t recommend bothering with smaller sizes than 1 cup. For family size containers freeze up to 2 cups per person in one container for dinner. Rigid containers or plastic bags work best for freezing soup. Leave room for the liquids to expand when frozen. Half inch of space in rigid containers. A small amount of room in plastic bags. Freezing soup in plastic bags is best done flat, on a cookie sheet so the bags don’t freeze in odd shapes. Flat they take up less room and are easy to stack. Do not use a home vacuum sealer when freezing soup. Liquids plus vacuum sealers equals one big mess in your kitchen. Chicken Veggie Soup, Jan 20, 09, cook pasta fresh and add for chicken noodle soup. Store up to 2-3 months according to the USDA. However, per usual, this timeline is a guideline for quality because soup does not spoil in the freezer. I freeze soup for up to six months without any problems. Ideally pull your frozen soup from the freezer about 24 hours before you want to use it. Let the soup thaw in the fridge and then reheat in the microwave or on the stove. Run frozen soup in plastic freezer bags under hot water instead of microwaving plastic bags. Soup can also be cooked from frozen in the microwave, stopping often to stir, or on the stovetop. I prefer to cook my soup from frozen on the stove. Soups frozen flat in plastic bags can be broken into smaller pieces by hand if they are not too thick. Put the soup, whole or in pieces, into a pan and add enough water to cover the bottom. The water prevents burning. For 2 cups of soup cooked from frozen on the stove top, with the lid on, over medium high heat, it takes around 10 minutes for dinner to be ready. 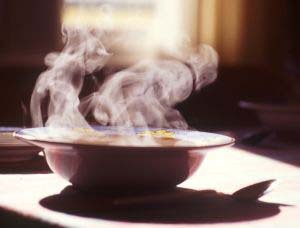 Use a low heat for soups with dairy in them, also try not to boil soups with milk, cream, eggs or cheese or they are more likely to separate. Return from Freezing Soup to the homepage of Favorite Freezer Foods.